How we drive 721k traffic from Google search engine? How we earned $5000+ in just 4-5 days? What strategies we have used to achieve this kind of success? What We Did to Achieve This Success? How We Worked to Achieve This Success? What We Did to Improve Our Earnings? 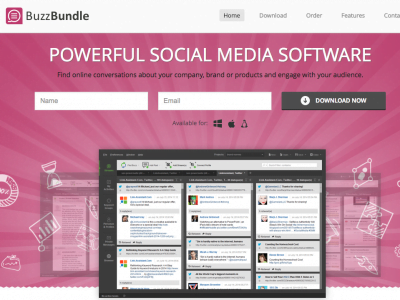 How We Monetized Our Blog? This is the first and foremost question which every reader might be thinking. Right? Actually I and my friend ” Atinder S. Gill & Sanu Siddharth – The Founder ” of this blog was working together on an event based niche blog. i.e. ” Happy New Year 2015 “. And Ranked it on the toppest position of Google with a most and highly searched keyword that is ” New Year 2015 ” as you can see the proof in the below screenshot. Many event bloggers and our competitors was targeting ” Happy New Year 2015 ” keyword to get ranked on top 1st position but We was targeting the shortest keyword i.e. ” New Year 2015 “. We both worked hard and achieved what we want to do. We ranked our blog on the 1st position of Google.com as you can see in the above screenshot. After getting ranked on the peak, we got a lot of success. Due to this, we got more than 721k Google traffic and charming real time stat which you can see in the below screenshot. 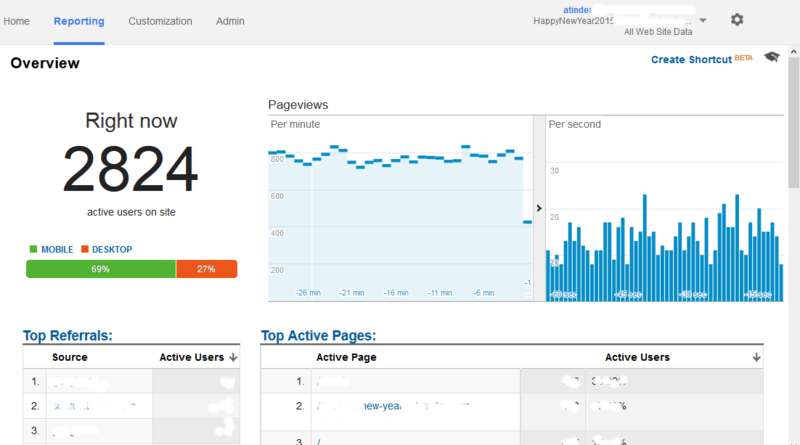 This much flood of traffic helped us to earn $5000+ in just 4-5 days. Now you might be thinking that how we did all this this. Right? You might be thinking that how we worked in order to achieve this success. So friends, It’s just the starting of this article, Just wait and watch, I will explain you all the things very clearly. So here comes the actual part of this article. In order to get this achievement, ranking of the blog is must. So we both worked wisely. After taking the decision that we both will work together on New Year 2015 event, the first thing was need to do is ” Domain registration “. So we searched for some highly searched keywords which will have high number of searches with low competition. etc… We was checking the number of searches in December 2013. After completing the keyword research, we found that below keywords are highly searched in December 2013. After getting this report, we found that ” Happy New Year 2014 Images ” is the highly searched keyword with 450k searches in December 2013. So we decided that we will also register the domain name with the corresponding keyword and then we registered ” www.happynewyear2015images.net ” as other TLD’s like .com or .org was not available that’s why we choose .net domain name. these 2 keywords are having huge number of searches in December 2013. So we targeted that we will try to rank on top with these 2 below keywords. Actually we are not that kind of guys who says that we ranked our event blog in just 7 days etc etc. We are the Newbie’s 😉 so we need to take care of every little things that’s why we have registered our domain name 5 months before the event. It means we have registered our domain name in August 2014. As I know that domain age is the most important factor in terms of SEO for event based niche blogs and we should register our domains 4-5 months ago. Due to this, we can easily make authority and trust in front of Google by maintaining posting frequency till 4-5 months. By doing this, when you will near to event then you will see that all your blog posts which you are publishing, getting ranked just after publishing the post because when you will publish 3-4 articles daily till 4-5 months then it will improve the authority and trust of your blog in Google’s eye and that’s why your blog posts are getting rank just after publishing it. And this is the reason for starting event blog 4-5 months before the event. After registering the domain name, we placed keywords wisely in the Title and Meta Description of the Homepage. Wait… lemme show you the keywords, how I placed it for our event blog. This is the format of keyword placement which I mostly use for event blogs. I always includes related keywords with main keywords so that blog can also rank for other related keywords and this blog has also ranked for other related keyword due to perfect keyword placement. Link building are the most powerful work which every event blogger should need to do in order to rank their blog on the peak of the Google. More powerful backlinks you have, more chances your blog will have to get rank higher in Google. I have created coutless backlinks in this 5 months and our most of the backlinks was indexed by Google. As you can see in the above screenshot, I have created around 3.4k backlinks from 218 different root domains by using our main keywords as anchor text which we are targeting and these backlinks helped us to get rank higher in Google. While creating backlinks, I never cared that either I am creating dofollow backlinks or nofollow backlinks. You should always remember that nofollow backlinks are also most important like dofollow backlinks. If you will only concentrate on dofollow backlinks then Google might slap your blog and pull your blog from search results and it happens to many event blogs as you all know that Google was rolling out Penguin 3.0 updates these days and it removes many event blogs from Google search results. Previuosly Our blog was ranking with all the related and main keywords in all the major countries like India, USA , UK etc but In order to improve our earnings, we set up a Geographic target for USA and then later our blog’s ranking was started decreasing from 1st position in all countries except USA. Due to this, We got flood of Google traffic from USA on event days which increased the earning of our blog. As you all know that Google Adsense is the best blog monetization program and We have also did the same. As we was getting good traffic from USA so we placed Google ads on our blog perfectly. As you can see in the above screenshot, 4 Adsense accounts are used. Chetan Gupta is a Newbie blogger from New Delhi, India and he used to share tip on blogging at his own blog i.e. GlobalCraze. 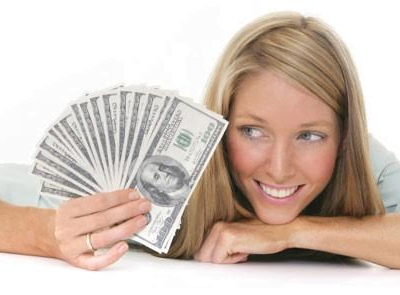 I am really inspired by your success,Really man you three made more than 5000+$ in just 4-5 days. Very much impressive. Thanks for the case study and giving your basic strategies for the event blogging. Thanks for sharing this wonderful guide. Just followed your tips and tried to create a event blog for India. But its not successful. But the learning is simply awesome and may be I will try further to build another blog. Thanks for the great advice. I am glad that I read this post at the right time because I am blogging since 2 years on competitive blogging tips niche where I didn’t earned any money, now I am looking forward to do one event blog to test my luck. I was little bit hesitant to start event blogs because I don’t know how to build backlinks to it which ranks the keyword, I thought I should create PBN to get backlinks, after reading this post I got confidence that I cam build links if I have time to do it without looking dofollow or nofollow. Now a days Event Based blog and niche blog are on peak and the main reason is Money in shot span of time. Iss saal kya, have you made any money from new year 2016 event ???? Glad, you’ve found this case study informative. I believe, having quality and valuable content can simply play off and as a blogger, it’s really crucial to view with the point of audiences – to succeed. where are you collect new year images. can you face any copyright issues? Does event blogging always works and how to monetize it? 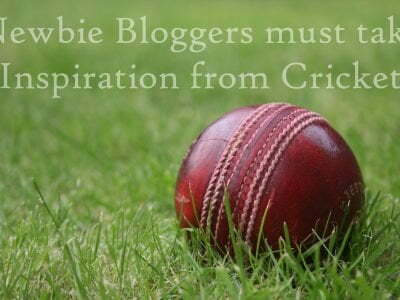 Its such an inspiration for all bloggers.I thing i have to follow your tips for success in blogging career. Hello Chetan Gupta, thanks for your this article. Really good one indeed. This is really helpful for me. Thanks for Sharing this knowledge man! Have a nice weekend.!! cheers..!!! can you tell me will i have to registered my domain 4-5 month ago before the event for event blogging???????? Glad to see that you made quite good amount on new year event. Amazed to see when I saw your earnings. Congrats! I hope I’ll also make such a big amount with my 1st event blog. Thats great. Thanks for sharing such an awesome case study. Just curious, you mentioned you “used total 4 Adsense accounts on our blog because we don’t want to take any risk”. Could you please tell how is it risky to use ‘Just ONE Adsense account’ in an event blog? Very great achievement I guess, I really love your enthusiasm towards blogging. I’ve been into blogging since many years but didn’t earning that much money in few days. This is an awesome achievement Bro. Could you please elaborate more on your link building techniques or share some useful articles related to that. I think this is the key factor for every website to rank well. Awesome post i read it about 3 times, i will try seo. i am use to buying high quality traffic. This is something insane. Event blogging rocks. Will be applying the same soon enough and ping you back if I find some difficulty. Thanks for your feedback buddy. keep reading at OnlyLoudest. You and your partner(Atinder) done a great job. This case study is really informative and motivates to do something different to make money. Our Pleasure Buddy. Keep reading. Congrats guys, did you used that 4th adsense account more days than others :), lol beat me next year ! see you around. Haha Sure Buddy 😛 na the traffic was on higher node when we used 4th account. Well, you can book whenever You want..between period of 1-6 months before that particular event. First of all congrats you guys. Thank you very much for event blogging guide, hope this may help a lot to newbie event blogger. But i have question that more than 1 adsense are allowed on same site at same time? I’m bit confused about this. Multiple adsense accounts are not allowed on same site at a time, but you can use one after another. It is safe to use. Example:- one day you can use your account and the other day you can use your friend’s account on the same site. Wow, its a very huge achievement, waiting for more awesome case studiea from you. WOW! A big “CONGRATS!” to your hard work and case study. That’s really a lot and you keep inspiring us bloggers to keep on going. Congrats! for this wonderful achievement. But one thing that I didn’t understand, why did you use 4 Adsense accounts. You must be showing max. 3 ads per page. Right? Yeah Just 3 ad units and we used 4 accounts to avoid any risk. Too much money in single account can be risky. That was amazing. congrats for your early new year acheivment. The case study is really awesome and very happy to see that per planning and hardwork can help you to gain huge success. It was direct Link Building. Very good achievement. Little bit luck also needed. anyway all the best and all success. Yeah! Luck always a crucial factor, no matter what you do. But what was the anchortext for your backlinks? did you use keyword for all of your links or there was some diversity in anchortext? We used keyword for some backlinks, but overall, we altered anchor text smartly to make link building look natural. Really appreciate your hard work…You played great with ur superb mind….hats off to u guys…..
Nice case study with detailed report. But will you please also write a article on how to create and maintain 4-5 adsense account. Yeah sure buddy, we will consider writing an article on it in future. Great case study with nicely explained strategies that simply the possibility for anyone to jump on boats this year and make a nice income online no matter where they are based. First of all i want to tell congrats to you. Thanks for giving this information. But if you tell about the backlink building then it is very useful to new bee’s. Have you bought any backlinks or how you did? Can you please explain in detail. Thanks in Advance. Well, to explain it in detail, we have to write a special post. We will consider it in future. It’s Good to see the article with short and sweet. My question may be funny but it’s most important? How many articles did you post? After got hitted by google i knew that domain age always matter with the nofollow links which i never considered that was a problem for me. Well i will try this things for my micro niche sites. This was a wonderful achievement bro !! Keep rocking and thanks for sharing your experience. Thanks Ashutosh for your comment. First One is, As I know, Using Multiple Adsense account on a single website is risky and may got Adsense account banned. Do you used Adsense account separately? That means, do you used different Adsense account for different days? And the second one is, What was your link building strategy? When I get to know about that news from Sanu.. I was really excited for that case study of it and finally its here.. Really awesome & Carry on like this.. Thanks sanju for your comment. Learn a lot from you. Hats offs to you and your strategy of work. I am big thankful to you because you have cleared all of my doubts. Congrats and cheers! 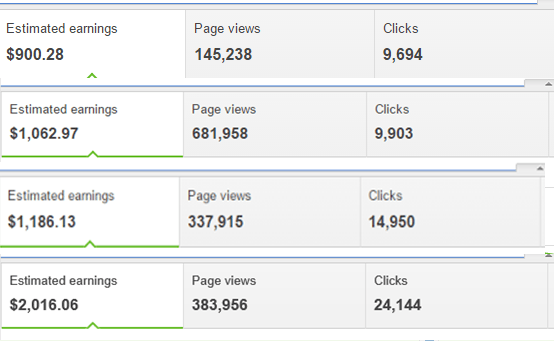 nice blog.how did u created 3.4k backlinks in your blog. That was the hard work buddy. We did it everything manually. What type of link building methods you have followed??? well, we used almost every link building method. How you used multiple AdSense account for one blog ? Can you make a tutorial post for that? Yeah! Sure. we will write a tutorial on this in near future. I am trying first time in Event blogging, and in this manner really this post helped me a lot now i am again motivated and charged to work on event niche blog. I glad, you’ve made quite good amount on new year event. Though I started 2 days before the event, I somehow managed to make 2k$ on 31st December. I was really amazed when I saw your earnings. Congrats! I hope I’ll also make such a big amount with my 2nd event blog. Thanks for stopping By. Great to see, you also earned a good amount. i want to know about backlink..how you hug backlinks? Well, Everything done manually. We created all these backlinks manually. How you build so much backlinks? Thanks for leaving your comment here and I would like to tell you that we haven’t used any Black Hat SEO Tool in order to create this much amount of backlinks. All the backlinks are created manually by us. First of all, a big congratulation to achieve this all and now want to say thanks a lot to share your experience with us. It give also a motivation and give a lot of information. Can you share the CTR of all the account especially 2000+ earning blog? one or two days before I got notification on facebook that you and atinder bro made 5K $ in last some days. Now you expose, how you made that.